Allan has been a friend of ours since before we started trading as 30th Century Comics, and has been a customer ever since. A talented writer and illustrator, he designed the original black and white version of our logo. 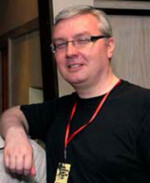 Allan Harvey is a Welsh writer and artist with a passion for comics. He has created comics for a variety of publishers over the years, including Factor Fiction Press, POS and the Comics Creators Guild. He has also written articles for Back Issue magazine, published by Twomorrows, looking at aspects of comics history. Allan was heavily involved in the A Distant Soil restoration, which saw him digitally remastering several hundred pages of Colleen Doran artwork to pristine glory for a new graphic novel edition from Image Comics. He is currently lettering the Simon & Schuster graphic novel Amazing, Fantastic, Incredible: A Marvelous Memoir written by Stan Lee and Peter David, with art by Doran. He lives in London, and is allergic to cats. We think you’ll enjoy checking out Allan’s blog and the website showcasing his work.